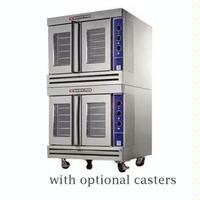 Full-size gas, forced air, single and double deck convection type oven. Standard specifications include 60,000 BTUH per deck, a two-speed fan with cool down and our patented wheel-within-a-wheel enhanced air flow system powered by an energy saving ¼ HP air cooled fan motor. Door interlock switch automatically turns the fan and burners off when the oven door is open. A manual rotary switch will turn the fan on when the door is open for quick cool-down. The 60 minute timer has a continuous ring alarm with manual shut-off. The indicator light glows when the burners are on. The oven interior measures 29” wide by 20” high by 22 ¼” deep. The cooking chamber is porcelain enamel over heavy gauge steel with removable 11-position rack guides with 1 5/8” spacing and 5 heavy-duty adjustable chrome-plated racks. The Oven exterior measures 39” wide by 39” deep with handles And 41 3/8” deep without handles (1051mm) by 32” (813mm) high. Front, top, sides and trim are constructed with stainless steel. Single oven legs are 31 3/8” tall (797mm) with casters and 27 5/8” ) with adjustable bullet feet and finished with Durable Black Powder Coating. Dual doors are 60/40 split-type with double-pane thermal glass, synchronized operation, stainless steel seals and double mounted “Cool Touch” handle. Doors are fabricated with stainless steel inside-and-out, and fully insulated with 2” of industrial grade insulation. Units are hardwired, plug and cord are not included. Adding the steam injection will increase lead time by 2-3 additional weeks.